Story suggestion by: Shara M. Email us a story. Last year, scientists totally pulled a “my bad” and reneged on their previous statement that Pluto is a full-fledged planet. Pluto has now been demoted to a “dwarf planet.” No really…I’m serious. That’s like the astronomical term and everything! With that logic, does that mean dwarf people aren’t full-fledged people? Well…according to scientist, probably so. Discrimination aside, kids across the land must find a new way to learn the order of planets. Growing up it was: My Very Educated Mother Just Served Us Nine Pizzas. Obviously, that will no longer work. 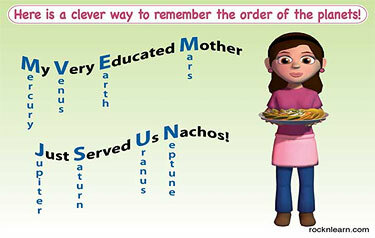 Fortunately, there’s a new phrase to help us remember the order of the planets. Story suggestion by: Dave M. Email us a story. A reader recently sent in this picture. When we first looked at the photo, we wondered why anyone would send a picture of a car for sale. After all, the site is ILoveNachoCheese.com, not ILoveUsedCars.com. Then we noticed that “I’HEART’NACHO” was the vanity plate! As the story goes, Dave was finishing up a morning round of golf when he spotted this car in the parking lot. Instinctively, he whipped out his cell phone and snapped a picture for us. So if any of our San Jose, California nacho loving readers are in the market for a red BMW, you may want to give (408) 272-7678 a ring. And be sure to tell the owner you found out about the car on ILoveNachoCheese.com! Who in the Hell Are These “Nacho Cheese” Guys? We introduced the nacho loving community to the inventor of the Microwaveable Nacho Box, we interviewed the creator of “Nacho Blasters,” and we’re preparing to have a one-on-one with the man behind the song It’s Nacho Love (That I Need). Some may have learned a bit about us from the Mercury News article, some may have heard our interview on KGO Radio, others may have even met us at the Alice @ 97.3 Cinco de Mayo Broadcast. Now you can learn a little more about the three guys who created ILoveNachoCheese.com. You can even sign up for our Twitters where we write about more than just nacho cheese. What a concept! So hop on over to our new About Us page and learn more… about… us… or something. Author Joe Brian and StevePosted on May 11, 2007 Categories Uncategorized1 Comment on Who in the Hell Are These “Nacho Cheese” Guys? Cinco-de-Mayo is almost upon us. To prepare everyone to get into the mood, we’re posting a link to a funky little Cinco-de-Mayo tune called “That’s Nacho Cheese.” So cut a wedge of lime, pour a shot of Jose Cuervo (that’s the Tequila the song recommends…not us. ), lick some salt, and crank your speakers. Author Joe Brian and StevePosted on May 3, 2007 Categories Uncategorized2 Comments on ¡Happy Cinco-de-Mayo! Yesterday, thanks to Hooman of Hooman TV fame, we were invited back to the 97.3FM Studio in San Francisco to host another nacho party for the Sarah and No Name Morning Show. While we didn’t get much air time during the visit, it was nice to see the crew again, hang out, eat nachos, and drink beers…at 9 in the morning. A nice bonus this time, was we were able to meet Justin.tv. Justin lives in San Francisco and has recently started documenting his life by wearing a camera on his head 24/7. Even in the bathroom. Even on a date. But that’s not why we like him or find him interesting. We like Justin because he loves nachos! Click here if you’re interested in seeing some pictures from the nacho extravaganza? 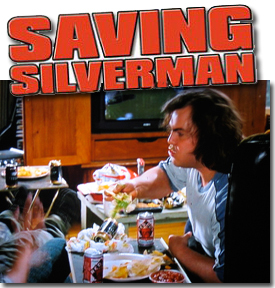 Today’s classic nacho scene comes from the movie Saving Silverman (2001). Although this scene may be short, Jack Black’s character, J.D. McNugent, reminds us of one of the most important rules when eating nachos with other people. Wayne: Hey! What are you doing? J.D. : Dude, if you get the nachos stuck together, that’s one nacho. It’s settled. If you grab a nacho and there are multiple chips stuck together, that counts as ONE nacho! Just one point of clarification. If a chip stuck together happened to lose a chip (i.e. one falls off) while in-transit to your mouth, then the fallen chip becomes a new chip. Just remember, if someone you are sharing nachos with doesn’t understand the rules, just point them to this site for a little education on nacho etiquette. Taco Bell has recently released a new item on their menu: Zesty Nachos. These nachos consist of chips, “zesty sauce with a kick and nacho cheese sauce”, seasoned beef, cool sour cream, and tomatoes. According to our standards, this is pushing the limit of too much. Last night my brother took them for a whirl. So how did they measure up? The Alamodome situatated in San Antonio, Texas has already seen some exciting NCAA Basketball. But today’s game against Ohio State and Memphis will determine which team from The South will advance to The Final Four. And while the fans will be cheering on their favorite team, nacho lovers around the country will be cheering for the fans. The Alamodome food service providers expect that during the course of the two days they’re hosting the tournament, fans will consume 350 gallons of nacho cheese! That’s enough cheese to fill this 5-6 person ThermoSpa Park Ave Hot Tub! Story suggestion by: Dan S. Email us a story. Inventors are cool. But inventors that invent nacho related inventions are cooler. An email recently hit our inbox with a list of various nacho patents. One particular patent, however, rose to the top as the most practical. Inventor, Kim Y. Edomwonyi, created packaging that enables microwavable nachos to be sold that will evenly distribute cheese sauce and prevent soggy chips. Genious! All we need now is to wait for someone to actually start manufacturing and using this breakthrough in nacho packaging. Click here to read more about this patent. Story suggestion by: Shara M. Email us a story. Students at Oak Trace Elementary School in Westfield, IN recently participated in Kidstown, a hands-on program that teaches kids about business and money by having them create and run businesses. What set Oak Trace apart from the rest or the participating schools was what these students decided to base their business on — nachos. “We voted on it, and nachos are something everybody wants,” said group member Zander Tidwell. Zander, we couldn’t have said it any better ourselves.